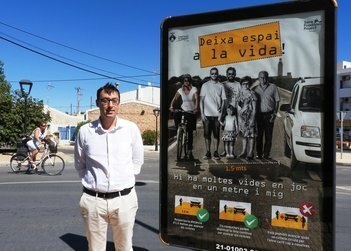 The Formentera Council's Office of Mobility has rolled out a plan to educate motorists about respecting cyclists' right to the road. In the words of department head Rafael González, the goal is to reach all motorists, although the campaign specifically calls out professional drivers—lorry, coach and taxicab drivers—for their role in heeding “rules that are there to save lives” as well as the minimum metre-and-a-half space to maintain when overtaking riders. The mobility office has plans to distribute 100 newly-printed posters and 2,000 informational leaflets to career drivers and automobile renters, as well as Eivissa and Formentera's small and medium-sized business association, the local chamber of commerce and information kiosks for tourists. From 12 noon, large-sized posters will be displayed at bus stops and other key points on the island. The rollout has been set to coincide with European Sustainable Mobility Week, 16-22 September. Secretary González pointed out how common it is for tourists and locals alike to opt for two-wheel travel with the mild temperatures of September and October. Furthermore, he said, as Formentera's youngsters head back to school this month, many of them will get there by bike. The posters and pamphlets both feature a cyclist atop her bicycle and a nearby passing vehicle with, occupying the space of a metre and a half between them, the bike rider's family. One and a half metres is the distance required to safely overtake a cyclist. The image hammers the importance of two things: the metre-and-a-half birth to give when passing cyclists and all the other lives at stake with vehicle-bicycle accidents. Also included in the leaflets are reminders of traffic rules as they relate to cyclist safety. Council members voted to implement the campaign at the administration's May plenary session.